Choices, choices. How your health fares often comes down to the foods you choose to eat. You have the power to make the smart – and yes, delicious food choices – to keep your blood glucose at a healthy level. In this guide, we share the worst — and some of the best — food and drink choices if you have diabetes. If you have diabetes, in many ways your diet is your medicine. As diabetes educators, we help patients understand what food and beverage choices are best to avoid. When foods are high in carbohydrates, fat and sodium, they increase your risk for high blood pressure, high cholesterol, weight gain, heart disease and uncontrolled sugar. Sweetened drinks. These include regular pop/soda, fruit punches and iced teas. These are loaded with sugar and calories, and they usually have little or no nutritional value. Instead, try infusing plain water with different berries and fruits so you can enjoy the natural sweetness. “Designer” or specialty coffee drinks – including frappuccinos or cappuccinos. That “once a day special treat” can add up to lots of extra sugar, calories and saturated fat. Instead, go for straight java, either black, with artificial sweetener or a small splash of skim milk. Whole milk. It has too much fat, which can lead to weight gain. Switch to 2 percent, 1 percent – or even better: skim milk. Keep in mind that one cup of skim milk has 12 grams of carbohydrates. If you don’t like milk or are lactose intolerant, you can drink almond milk, rice milk or soy milk instead—but remember to get the low sugar varieties. Hot dogs. 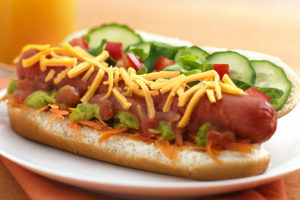 These grilled little favorites are still high in saturated fat and sodium—yes, that even includes turkey dogs! Try to avoid them or eat them only occasionally. Packaged lunch meats. These are also high in saturated fat and sodium. Check your deli for low sodium meats—or better yet use sliced meat that you’ve roasted at home to make your sandwiches. Also remember that sandwich toppings can be very unhealthy too (think high-fat mayonnaise). Instead add flavor to your sandwiches with mustard, veggies and/or a little bit of hummus. Sweetened cereals. These are high in carbohydrates because of the added sugar. Go for the plain cereals and add a little fruit or artificial sweetener. Regular pancake syrup. It’s very high in carbohydrates. 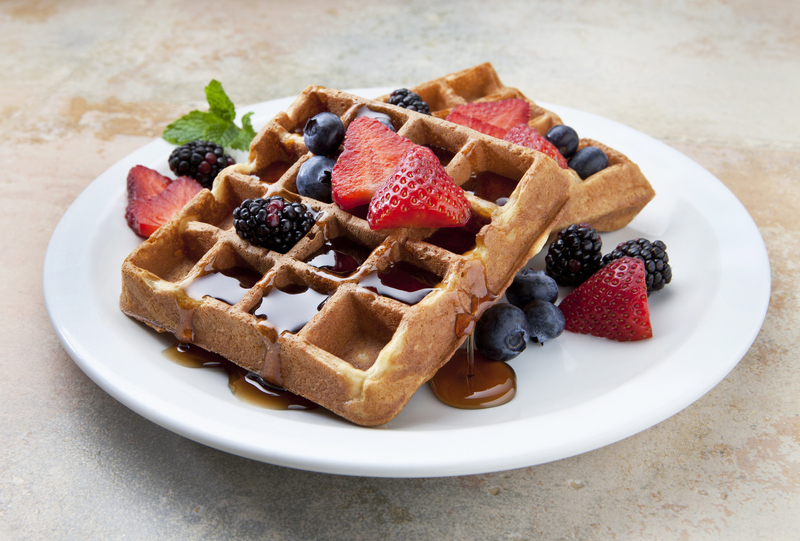 Light or low-calorie syrup usually contains at least half the carbs of regular. And with these lighter syrups, remember that the serving size is small, and generally only one Take a look at the food label and use sparingly. Sherbet. Many people believe sherbet is a good alternative to ice cream, but a half cup of sherbet has almost double the carbohydrates of a half cup of ice cream. 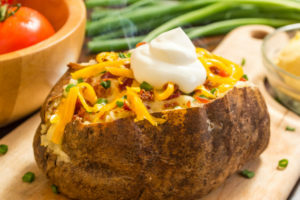 Fast food baked potatoes with all the fixin’s. 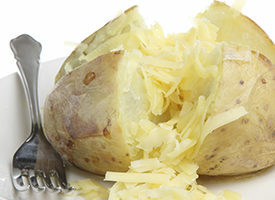 You take a relatively healthy item—the plain baked potato—and add cheddar cheese, butter, sour cream, ranch dressing or bacon and it just turned into a high-sodium, fat laden disaster. The same goes for nachos and other cheese-covered appetizers when eating out. Anything fried. We know fried foods are bad for us, but for people with diabetes, they are the worst. The fat is absorbed into the food and leads to high cholesterol and weight gain. Fried foods cause diabetes and fried foods make diabetes worse. This goes for everything from French fries to fried chicken to that panko-crusted tilapia at your favorite restaurant. All of the foods on our list have a low glycemic index (which represents the total rise in a person’s blood sugar level after eating the food) and provide important nutrients you need to stay healthy. Cruciferous vegetables. These include broccoli, cabbage, cauliflower, kale and Brussels sprouts. These non-starchy vegetables are rich in potassium, folate and vitamin C. 1 cup raw or ½ cup cooked = < 1 carb serving. They are just 5 grams of carbohydrate and 15 grams is one carb serving so you can load up on these!